One of the best ways to upgrade your home is through natural stone installation. There is an element of sophistication and class that natural stones offer. Natural stones set on the facade, flooring and even interior walls can transform a modest home into a breathtaking one. Most home owners are not be able to undergo natural stone installation for their entire home due to the costs. However, there are many other options that could fit into just about any budget. Whether you have a pool, barbecue area, fire pit or a simple patio, you can enhance the look and feel of your backyard with natural stone. You can use natural stone flooring for a deck, backyard walkway or an entire patio. There are some great ideas for smaller budgets as well. Accents around pool areas, barbecue areas, fire pit circles or just the patio. For complex backyard projects, it is recommended that you use a Reno outdoor design contractor. They can offer you a cohesive, well-structured and sophisticated look. First impressions are the most important. Homeowners want their homes to have curb appeal. A natural stone walkway is a quick and easy way to upgrade a home’s curb appeal. It’s the ideal choice for homeowners that have a tight budget. The material, patterns and colors will all be vital to achieving your desired look. 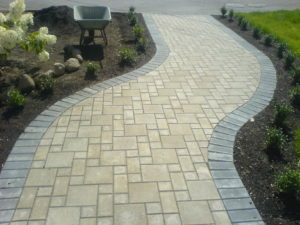 A natural stone contractor, at the right Reno masonry, will help you create a beautiful walkway. The facade is the exterior of your home that faces the street. Most masonry contractors in Reno are familiar with facades. Installing stone veneer to the front entrance wall is a great way to upgrade your home’s look. The stone wall will act as a focal point for the rest of your homes exterior. When combined with natural stone accents, it gives the impression that the home was originally designed that way. Install stone walls around the foundation of your home. They serve as a great addition to the stone in the facade of your home. It seems natural to have a design that combines wood and stone. However, it is far more than aesthetics. Installing natural stone to your home’s foundation will also protect your foundation. By keeping moisture out, stone protects your walls from the weather. Natural stone installation can enhance the inside of your home as well. However, it should be limited to certain areas. A few great places to install natural stone include kitchens, family rooms, large dining rooms and fireplace areas. It adds a touch of elegance while providing added functionality. For example, natural stone can be great for a room with a fireplace as the stones can protect your walls from fire. Installing a natural stone wall around your home as a “fence” is an idea for homeowners that already have natural stone on their home . This stone wall will serve as the frame for the rest of the home and help set the theme of the house. This is could be an option for homeowners that have larger budgets and want further upgrades. 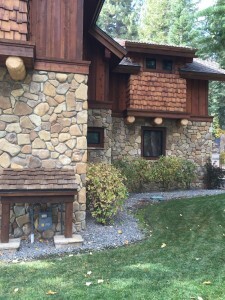 Stone trims are a common job for masonry contractors in Reno. Stone trims work just as well as natural stone on the facade. They go a long way in enhancing the look of every side of your home. As an alternative to natural stone on the facade, it typically requires less surface area coverage. Are you considering natural stone installation for your home? If so, let us help you achieve your goals. 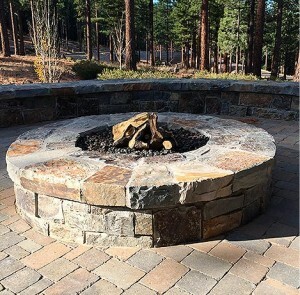 Eric’s Concrete Pavers is one of the most trusted masonry contractors in Reno. We have over 20 years of experience in installing pavers and natural stone veneers. Contact us and tell us about your home improvement project. You’re thinking about pavers for your driveway. Your friends may tell you, “It’s just a driveway!” But somewhere deep inside, you know it’s more than that. Gone are the days when a beautiful home exterior meant bushes trimmed, grass mowed, and walks swept. Maybe a few flowers. With the price of homes today and a more competitive market, the exterior of a home becomes as important as everything you’ve worked to achieve indoors. What Qualifies as Beauty in a Driveway? Think total picture. In an older city neighborhood or a new subdivision, you don’t pay attention to the driveways you pass. Until one day you see something unexpected: an unusual pattern or color used in a driveway with concrete pavers. It may not occur to you then, but installing pavers for driveway has completed a theme for that home. The exterior colors, textures, and design come together just as the owner intended. You just know that what you see looks complete and that it’s beautiful. Where’s the Brawn: Concrete or Driveway Pavers? 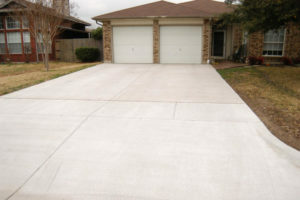 Concrete driveways have been around as long as the automobile’s first appearance. A driveway had to be strong enough to support the standing weight of a motor vehicle as well as bear a moving load. But installing driveway pavers, roads, and patios is traced as far back as the 6th century BCE. The Romans needed a better way to move troops across the known world. 2,500 years later, those same pavers are still seen in many parts of Europe. Interlocking pavers were developed at the end of WWII and are still in use today. Durable? You bet! • One thing to remember is that whether plain or stamped, concrete is concrete. Though stamped or stained concrete is attractive, it’s still the same concrete as a regular driveway. You also have higher labor costs for installation and all the problems inherent with concrete. • Concrete usually runs between 3500 – 4500 PSI (pounds per square inch). The recommendation is 4000 PSI. Concrete cures to its required strength in 28 days. It acquires about 70% of its required strength in 7 days. That means you can drive your typical family car on it in a week, though don’t drive on a corner or an edge. Your pick-up or van? Better wait a month. • Unlike pavers, even after curing, typical concrete drives are prone to cracking, particularly on a driveway’s edges, but many times at random places. 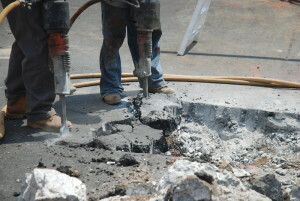 • Repairing cracked or broken concrete is very difficult. You have to saw out the entire broken area. Then you need to match the right color, consistency, and finish. • Concrete, even stamped concrete, can be slippery when wet and a fall hazard. Keep in mind the conditions your driveway will be subjected to: rain, snow, ice, water from lawn watering or car washing, etc. • The up-front costs of concrete are the least expensive between the two. It runs about $4-6 per square foot installed. Stamped concrete costs about $8-22 per square foot installed. It depends on where you live, what finishes and colors you choose, etc. • A combination of water, portland cement, sand, and gravel go into making interlocking concrete pavers for your driveway. They are more porous than plain concrete and the interlocking feature prevents pavers from rotation or side-to-side slippage. Once in place, they stay in place. • Pavers are load-bearing to 8,000 PSI +/- (Compare this to the PSI for concrete). Because they have no need to cure, they can be driven on immediately. • If a paver does crack or becomes discolored, you can replace it with little work and cost. 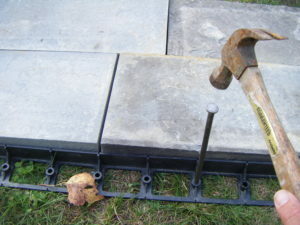 • If you need to run utility lines or television/internet cables under the driveway, you just have to take up a few pavers, run the lines, and lay them back down. Concrete must be sawn out and poured again leaving seams and a difficult color and texture match. • You can add a more textured look with pavers for driveway with grass. Spaces between pavers are allowed to fill with grass or moss. Mowing is easier than with a concrete drive: just mow right over the pavers. No edging needed. • Harsh weather conditions are not an issue with pavers. Due to their absorbency, most water leaches through which is environmentally friendly and also good if you’ve gone with driveway pavers with grass. Also, the absorbency doesn’t allow water to pool making it less slippery and more difficult for ice to form. • Average cost of pavers runs from $4-20 per square foot installed depending upon your location, type of pavers selected, etc. Why go for “acceptable” and put in an ordinary concrete driveway? Ramp up the wow power of your home’s curb appeal and add value to your property with the use of beautiful, durable driveway pavers. Want another dimension? Tie the pavers used in your driveway into sidewalks and patios. There’s nothing that will say “quality” like a home whose driveway and walkways are finished with pavers. Excited to find out more? Contact us to learn how to showcase your home. A brick or paver stone patio is a classy alternative to a concrete driveway. Paver stone patio installation is time-consuming, but with hard work you can accomplish it. And if it’s built right, a brick or stone patio will be easy to maintain and last for a long time. You’ll save yourself a lot of time and frustration by doing the job right the first time. Ease of maintenance depends in part on quality construction and top-notch materials. The bumpers on your paver stone patio will keep it from shifting and cracking over time. Sealing the grout properly will keep it from deteriorating or becoming discolored. Here are our tips for doing a great job of maintaining the natural beauty of your paving stone patio for the long term. When designing your patio, make sure to buy two or three extra pavers. That way, if a paver gets chipped or cracked, you’ll be able to replace it with one that looks just like it. Use bumpers on your paver stone patio installation to keep it looking clean and neat. This will make it easier to use a weed trimmer around the patio, and it will combat grass encroachment. It will also be easier to maintain and less likely to lose grout over time. Between the grout, apply a layer of polymeric sand over all of the pavers. This is a sand and concrete mixture that contains polymer materials. Once you wet it down with a hose-end sprayer, this material will harden and prevent weeds from breaking through. Use an acid wash to remove any grout film on the tiles. This will also remove any discoloration on the stone caused by moisture. Be sure and use a grout sealer when you’re finished filling in between the cracks and after acid washing. A sealant will make it much harder for mold and mildew to form on the grout. It will also keep it from crumbling. Naturally, you’ll want to sweep dirt, leaves and yard waste off of your patio. This will not only keep it clean, but it will also prevent grass seeds from sprouting in built-up dirt. Once grass gets an opening, it can even crack cement as the roots expand. Another good idea is to use a hose-end sprayer once a week to give your stone patio a good cleaning. You can also use a small amount of dishwashing detergent in a bucket of hot water to scrub the stone. An outdoor push broom works great for scrubbing your stone patio. If you need to get rid of stains, try using a soft wire brush. You don’t want one that’s too coarse and stiff because it could leave scour marks on the stone pavers. Pressure-washing is fine for a brick or stone patio, but be sure to aim the spray at the surface of the stone, not the grout. Experiment with the amount of force needed by starting out at less than full power. If you find that grass or weeds have begun to stake a claim on your stone patio, the best solution to get rid of them is a spray bottle of white vinegar with a teaspoon of dishwashing soap. It will kill any vegetation that has taken hold on your patio, including unsightly mold. Stone patio sealant should be reapplied to the grout every three years. This will prevent the polymeric sand from degrading and keep your grout looking great. Be sure to follow these steps when designing, constructing and maintaining your paved patio. It can stay new-looking for years to come if you take the time to carefully plan ahead. Maintenance is pretty straightforward and not too difficult. Once it becomes a habit, it will seem like second nature to sweep, spray and seal your outdoor entertainment area. A professional can also install your paver stone patio. Pavers look great on a driveway and around the pool, too. If you’re not a do-it-yourself kind of person, contact us today and find out about the variety of stone and masonry projects we have to offer. Have you ever heard of hardscaping? Hardscaping is like landscaping but refers to methods and designs that employ hard objects like gravel, stone and concrete. Erecting fences or building walkways, patios, and lighting requires devotion, skill, and the right tools. However, it doesn’t mean that hardscaping is difficult to do. In addition, these projects may even add beauty to your front yard and help you save money on maintenance costs. Here are some cool hardscaping ideas for your home that you should consider. And elegance to your hardscaping with concrete pavers. Who doesn’t love a little bit of green in their backyard, right? Sadly, not everyone can afford the maintenance costs needed to tend grass and decorative flowers. Thankfully, you can still add beauty to your backyard by using gravel and stone. This concept is ideal for households that are frequently experiencing drought. Even with little maintenance, your “rocky garden” will still look fantastic. If you also want to up your landscaping game, you can also add some crushed granite or river rock. Don’t worry — these glass shards will not shred your skin when you walk on them. If you use glass for your patio improvement project, you need to thoroughly break down the shards, clean them, and tumble them until they have a finer texture. The good thing about glass gravel is that it lasts for a long time. In addition, it comes in a variety of fun colors and sizes. This will surely accentuate your patio and walkway. 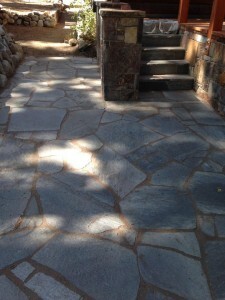 Flagstone is great for patios and walkways. To be honest, a patch of grass does not really look that enticing. No matter what neighborhood you are in, you will notice that people only come out when it is time to mow their front yard. If you really want to be more visible to the community, you need to go out there and stay in your yard for a little bit. In order to make your patio look more refreshing and friendly, check out one of the more popular hardscaping ideas: build it using flagstone. And with a fancy outdoor umbrella and furniture, you will love relaxing outdoors than indoors! To add more beauty to your hardscaping project, you can also decorate the gaps with limestone. Aside from creating style, the limestone prevents water from seeping into the flagstone and damaging it. Eric’s Concrete Pavers specializes in designing and creating breathtaking hardscape layouts. We will work with your goals and ideas and develop the best hardscaping plan for your home and budget. Come check out our work and contact us today! We look forward to working with you! If you watch a lot of television shows, you probably think that demolition jobs are all about randomly smashing a wrecking ball on a building or house. However, there is so much more to this task than what is normally seen on tv. Here are important things that you need to know about the wrecking and demolition industry. 1. Demolition does not mean explosions. Using explosives is one part of the business, but this is not the only way to bring down a structure. There is the balling method, which is effective at destroying larger structures that are already badly damaged. Demolotion experts also use a pusher arm, an excavation machine that’s hydraulically-operated. Pusher arms are advantageous when you’re working on vertical surfaces and small buildings. Other methods are wire rope pulling, excavating, thermal lancing, and sawing. If your wooden floors or walls need to be replaced, you do not need gigantic power tools to do it. In fact, you can actually do it on your own, provided that you have the right protective equipment. In order to remove wooden floors, you need pry bars, a hammer, and a putty knife. You can either completely destroy your wooden materials, but you can also opt to work gently in order to use them for other projects. To get started, pry open the woodwork using a putty knife. As the gap widens, use the pry bar to further separate it from the wall or floor. Make sure that you have a second pry bar so that the wood will not snap back while you are working on another spot. Both terms are often used interchangeably, but they actually have major differences. The first term refers to the traditional method of bringing down a structure using special tools. Everything will be destroyed, so the materials will be sent straight to the landfill. Deconstruction, on the other hand, is a newer method that involves carefully taking apart a structure piece by piece. Materials that are not totally damaged are recycled, while the other unusable parts are sent to the dump. The advantage of the former is that it is budget-friendly and doesn’t require a lot of manual labor. Deconstruction, meanwhile, is pricey. However, the process is environmental-friendly and you can use the salvaged materials for other home repair projects. If you do not want your neighbors to be angry at you, visit them and vicinity and inform them about your project. You can also offer them a bottle of wine, cupcake, or a pair of earplugs! 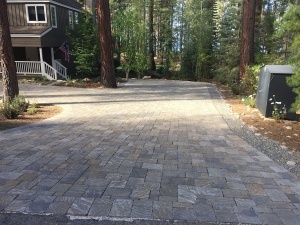 If you need concrete demolished in the Reno and Tahoe area, the professionals of Eric’s Concrete Pavers has the experience and expertise to get the job done right the first time. Come check out our services and contact us today!